A shamefaced thief caught on CCTV as he walked out of a Hampshire pub with a urinal in his rucksack has handed himself in. The 42-year-old man, who has not been named, handed himself in to police in Salisbury on Monday evening. The man, from Salisbury, Wilts, told police he had taken it from the Royal Oak pub in Southampton as a "souvenir". 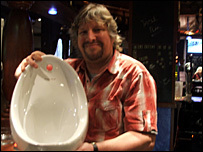 After being reunited with the urinal, delighted landlord Alan Dreja said he may put it on display in the pub. "Three policemen returned it," said Mr Dreja. "The publicity which surrounded the theft seems to have flushed him out." The tale of the stolen loo has been reported as far afield as Canada, New Zealand, Australia and Thailand. The space left behind when the thief expertly unplumbed his prize has already been filled, so now the landlord has a dilemma. "I don't know whether to put it on display in the bar, or put it on eBay", he said. The thief has been given a caution.